We turn this week to a small though powerful paperback by Frances Cole Jones that is heavily laden with recommendations and information elemental to everyone living in today’s fast paced world. Noting that every elevator ride, luncheon, BBQ party, church picnic or seemingly chance meeting can turn into an impromptu interview or sales exchange Frances Cole Jones communicates the delicate nuances of being able to react quickly and reap the potential rewards. You need to be “on” but just how “on” is critical. Frances Cole Jones and Cole Media are the branding power behind many top names. She is the quiet behind-the-scenes entity that nurtures others so they may roar. Her presentation style is entertaining and easy to grasp and as sharable as it is useful. These are major approaches to brand posture and not mere tweaks. She will move you towards being your very best self and presenting that in a powerful way. Frances Cole Jones is “The Enhancer!” Pay attention. Communication is everything. Did you know that 85% or more of reaching an accurate medical diagnosis comes from taking a good patient history alone? In business and sales, one of the most important things is to be an effective communicator. In essence, every transaction, or potential deal requires you to woo or persuade another person to buy or sign up. For those of us struggling to find a job, the way we present ourselves in interviews is crucial. Communicating effectively is at the heart of almost every issue affecting our daily lives. 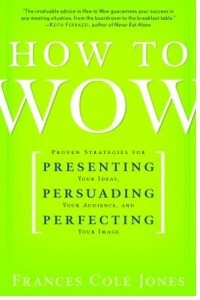 Frances Cole Jones is the author of How to Wow: Proven Strategies for Presenting Your Ideas, Persuading Your Audience, and Perfecting Your Image. In today’s fast-paced world, where an elevator ride with your CEO can turn into an impromptu meeting, your lunch date can become a job interview, and your conversation at a cocktail party may be a preamble to a potential business merger, knowing how to market yourself in any situation is vital. In How to Wow, Frances shares her strategies for making your mark in business and in life. Every encounter, Jones believes, provides you with an opportunity to positively influence colleagues, employers, neighbor’s even competitors. Not only your words, but also your tone of voice and your body language speak volumes. The question is, are these aspects working together to say what you want them to, as effectively as possible? Listen to my interview with Jones to find out the tips and tricks to commanding attention through effective communication. Nothing will help you more in preparing for that next, tough job interview. Even your personal relationships will prosper as you put this information to work in the way you communicate. Start with the art of the one-on-one encounter; add in strategies for interviewing, maximizing meetings and presentations; then finish off with making the most of social interactions. All together you get How to Wow: Proven Strategies for Presenting Your Ideas, Persuading Your Audience, and Perfecting Your Image, a resource to help you succeed in any situation. You can read the book cover to cover (like I did) or jump to the chapters that apply to you. With either approach it is one of those books you’ll keep in your library and reference for some time to come. In How to Wow, Frances Cole Jones covers some oldies but goodies like reminding us that 7% of your impact comes from the words you say, 38% from your tone and 55% from body language. Jones also packs in a number of invaluable strategies for helping make all meetings and social events successful. I found one technique priceless – writing a diary entry as if it were tomorrow. If you have an important meeting or event coming up, write down details of the event as if it had already happened. This technique helps you think through potential scenarios and prepare for the meeting or event. This is similar to the Field of Dreams mantra, “If you build it they will come.” If you write it down it will happen. Jones’ conversational writing style makes this a fun and easy read. I felt like I was her long time friend and she was just giving me some good sound advice over coffee. She pulls many of her thoughts from her vast library of experience working with executives preparing for TV and print interviews and large scale company meetings. Although many of her examples may not directly align with your role, you will not find it hard to bridge the gap and find ways to implement her strategies. Whether you facilitate meetings or just attend them, host lunch meetings or just get invited to lunch, present to large groups or just one person, you’ll find significant value in reading How to Wow. I’m happy to share that How to Wow: Proven Strategies for Selling Your [Brilliant] Self in Any Situation was shortlisted for the 800-CEO-READ Business Book of the Year Awards. In the “Sales” category, How to Wow: Proven Strategies for Selling Your [Brilliant] Self in Any Situation was shortlisted among Smart Selling on the Phone and Online: Inside Sales That Gets Results by Josiane Chriqui Feigon, How to Sell When Nobody’s Buying: And How to Sell Even More When They Are by Dave Lakhani, and Persuasion: The Art of Influencing People by James Borg. A Seat at the Table: How Top Salespeople Connect and Drive Decisions at the Executive Level by Marc Miller won best in category. Thank you to Jack and everyone else at 800-CEO-READ!